See your patient satisfaction rates soar and clinical outcomes improve with an efficient patient engagement solution. MEDHOST YourCareCommunity is built on prevailing industry standards, making it vendor-agnostic, and as an SaaS-based solution, no hardware or software needs to be installed at the Customer site. 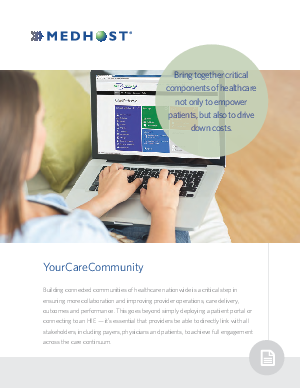 Designed to improve care, safety, satisfaction and the availability of health information, MEDHOST YourCareCommunity also helps providers stay ahead of regulatory requirements.